The Markt is in the heart of the town centre and is the perfect place to start the day. The square is surrounded by numerous medieval buildings and it is here that the Belfry tower is located, a tower which can be seen all over town. Those game enough to climb up 366 stairs just like the characters of the movie ‘In Bruges‘, will be rewarded with a fantastic panorama over the old town. Bruges is very compact and perfect for exploring on foot. Head down Breidelstraat to another smaller square, the Burg. Surrounding this square is the Town Hall and the Basilica of the Holy Blood (named after a relic inside which is said to contain Christ’s blood). Pass over the bridge into Tanners Square, then follow the river around the corner to the right to Rozenhoedkaai, undoubtedly the most picturesque corner of Bruges with a beautiful view over the canals and Belfry tower behind. Simply wander around at your own pace, it’s easy to get lost but due to how compact Bruges is, equally easy to find your way again too. At some point head into The Church of Our Lady (note: currently undergoing some construction), then wander down Mariastraat, of course stopping via the many fantastic chocolate stores along the way. After grabbing some lunch nearby, for a different perspective of the town get on a boat tour across from Saint John’s Hospital. After your tour, continue walking down Katelijnestraat in the direction of Minnewater Park. Say hi to the many Swans which wander around here. Then cross the bridge into the Begijnhof, a beautiful and tranquil oasis. If you’re just in Bruges for the day it’s easy to walk back to Bruges train station from here, otherwise, head back to the main part of town via Steenstraat, the main shopping street which features every major brand you can think of, plus many more magnificent Belgian chocolate and souvenir stores. Having covered most of Bruges’ sights on Day 1, spend perhaps another half or full day simply soaking up the atmosphere, the canals, and heading into a few of the towns museums, the most popular of which being the Groeninge Museum, featuring Flemish art mainly by painters from Bruges. Having covered most of Bruges’ sights on Day 1, spend Day 2 exploring some of the towns museums, the most popular of which being the Groeninge Museum featuring Flemish art, mainly by painters from Bruges. History buffs might be interested taking a tour of Saint John’s Hospital (which also includes a Picasso gallery), the Beguinage Museum, Gruuthus Museum, Folklore Museum or Archaeological Museum. Music buffs or travellers with kids may like to consider a visit to the Sound Factory. - Brussels. Belgium’s busy capital, obviously much larger in size than the other towns and you’ll probably be passing by here anyway. 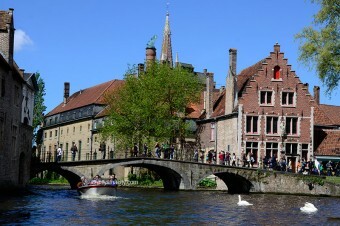 How many days do you think visitors should spend in Bruges?